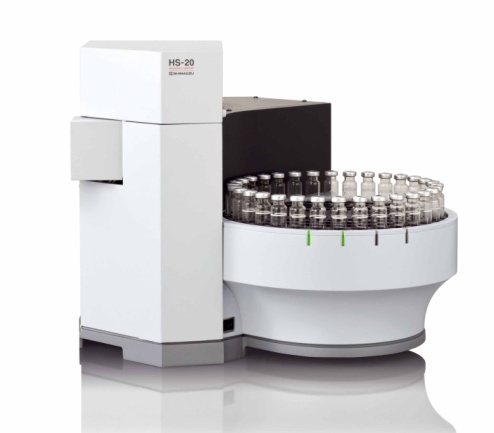 Shimadzu, one of the worldwide leading manufacturers of analytical instrumentation, has launched the HS-20 gas chromatography headspace sampler for accurate analysis of an even wider range of volatile compounds with boiling points ranging from low to high. The HS-20 heats liquid or solid samples sealed in a container to a specific temperature, and injects the volatile compounds diffusing into the gaseous phase into a GC or a GCMS. These systems are widely used in the fields of environmental and pharmaceutical applications as well as in materials and food products analysis and forensics. The HS-20 will support these analyses particularly in testing and inspection organizations. The unique configuration of flow lines and the oven enables the analysis of high boiling point compounds while minimizing carryover. Using the electronic cooling trap, it is also possible to concentrate the headspace gas for analysis of compounds with extremely high sensitivity. Headspace samplers enable easy analysis of volatile compounds. They are used in various fields requiring higher reliability, such as analysis of VOCs (volatile organic compounds) in the environmental and quality control applications of pharmaceuticals whereas in food products and materials control a wide range of volatile compounds with low to high boiling points has to be detected with high sensitivity in order to provide accurate qualitative and quantitative results for numerous measurement targets. In order to increase the reliability of data in continuous analysis of headspaces, carryover needs to be minimized; not even highly adsorptive compounds may remain in the flow lines. The special deactivated sample flow lines and unique flow line structure of the HS-20 reduces sample adsorption, to achieve an extremely low carryover of 0.0001 % or less even for highly adsorptive acetic acid. The HS-20 oven can be set to a maximum of 300 °C to enable analysis of high boiling point compounds difficult to detect with conventional headspace samplers. At just 30 cm, the HS-20 provides the shortest transfer line in its class between headspace and GC. In this way, even high boiling point components such as phthalate esters or cyclic siloxanes can be introduced efficiently to the GC column to achieve high sensitivity analysis. This means that the apparatus can also be applied in quality control of chemical product materials. The HS-20 trap model concentrates the headspace gas for high sensitivity analysis of volatile compounds generated from the sample. Also, by cooling the trap unit to -20 °C using the electronic cooling function, low boiling point components can be concentrated efficiently in the trap. For example, components with a wide range of boiling points, such as odor components, can be analyzed with high sensitivity to achieve easy qualification using GCMS mass spectra or easy quantitation of trace components.